Lazoo, originally based on a series of best-selling Japenese children's books, is a children's brand that brings creative and fun products into any child's home. Lazoo's mission is to foster a child’s creative process, encourage self-­expression, and empower the imagination. We were delighted to receive samples to review from Lazoo to review! 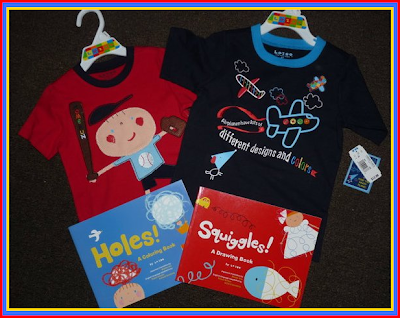 We received two shirts, and two awesome coloring books! The fun shirts are from Lazoo's new spring line, which can be exclusively found at Babies R Us in sizes 6M-4T! The shirts we received were priced at $12.99, so Lazoo products are very affordable for any budget! These shirts are so cute and fun! These are the backs of the shirts...the happy baseball was easy, but the happy plane had me stumped for a minute! The shirts fit the boys wonderfully! 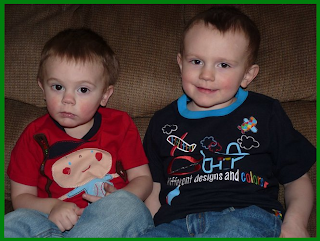 Gabriel loved pointing to all the planes on his, and looking at Nolyn's shirt too. The shirts are so bright and colorful! These shirts washed well too, we did have some minor shrinking (shirts are 100% cotton) , but they still fit the boys well. The plane shirt does have 4 colorful buttons sewn on it, these decorative buttons do make me a little nervous as I wouldn't want them to fall off and end up in my 4 month old's possession, but so far they seem secure. It will just be something I am very conscious of after every washing. The coloring books are like none other. Lazoo has a great line of activity books! 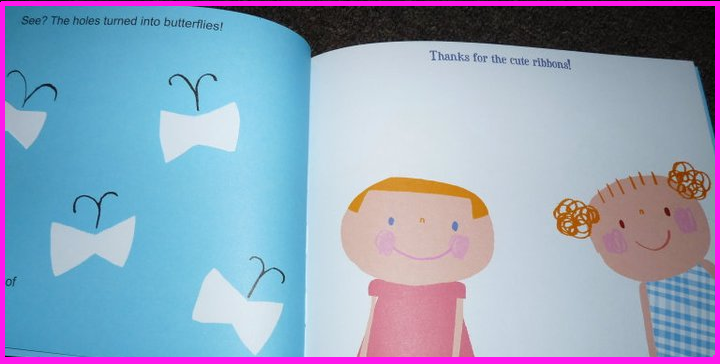 Turn the page and the holes turn into butterflies, and the place that was colored turns into bows for the girls! These activity books are quality, not like normal coloring books...more like an actual story book that is intended to be colored in. Besides the awesome quality, these activity books are amazing because they invite creativity and teach children new ways to use their imagination! Squiggles shows a child how a simple squiggle can be fish scales, a beard, or a lions mane! Holes show children different shapes and what can be made from the shapes! I personally think these are a great keepsake! My boys will color in them, and I will keep them to look back on. Lazoo's books are $6.99- $14.95 which is a very fair price! You really need to see these books to fully appreciate them, the pictures just can't give you the overall quality that these books truly have. I have been given the chance to offer two activity books to my US readers! Giveaway will close 3/18/2011 at 11:59pm. Two winners will be chosen via random.org and given 48 hours to reply to the email I send, if no reply within the time limit the winner will forfeit the prize. I received free products in order to conduct this review. I received no monetary compensation for this post. All opinions are my own honest opinions. I 'like' Lazoo on Facebook. I really "like" lazoo on Facebook! I like the Squiggles book! I think my boys would enjoy the "All About Faces" one the most! I'd like to win Imagine That! for my daughter.